Calling all neighbors to come on out — SELL and SHOP — on Saturday, October 7th from 8:00 AM to 2:00 PM. See attached flyer for details. And contact Kimberle Bowers (2kbowersmom) or Brittany Blackie (brittanyblackie) if you have any questions. Very disappointed with this year’s sale. Last minute advertisement, very limited on-street signage, and when we drove through the community, we saw no sales. Truly disappointed. 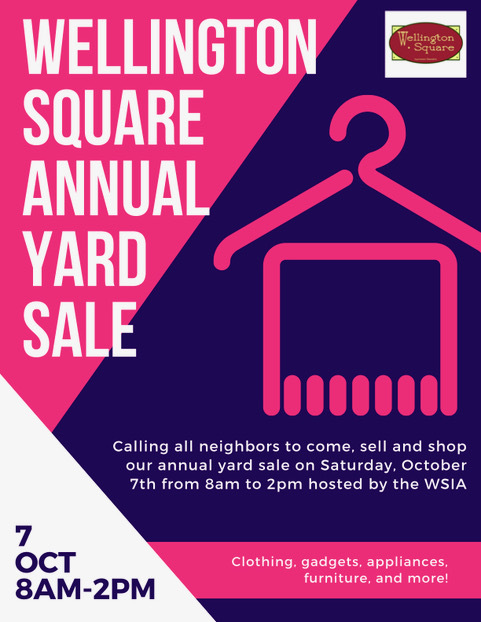 Good day, When is the next Wellington Square yard sale fir 2018?